I downloaded a Chrome OS disk image from Linux Magazine in Germany, but there are quicker downloads available. I installed this in VMWare Fusion, but it also works with Virtual Box and surely with Windows or Linux VmWare. Remember that what you have is a disk image - not a VMware appliance. The only problem I had was networking - it apparently needs to be bridged, not NAT. Once I changed that and rebooted, everything worked. It takes less than 15 seconds on my Mac to get to login. That's not half bad for a VMware machine. The login is "chrome@gmail.com" and the password is "chrome" if you don't already have a Google account. That's all you need to get started. If you've read about Chrome OS, you know that it's basically Linux in a kiosk mode. The only apparent application available to you is the browser. However, that's not really true: a "Ctrl-Alt-T" will open up a terminal window. 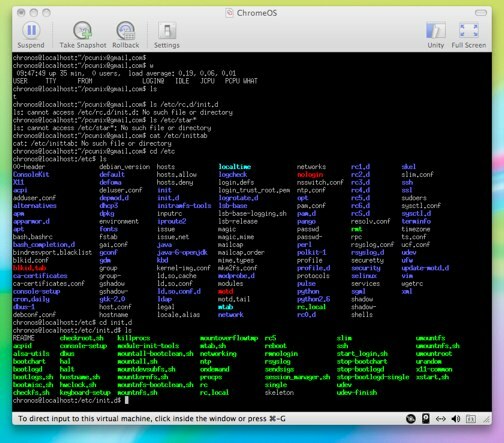 One there, you'll find that you are really logged in as "chronos" and that you can use "sudo" for anything you need to do as root. (password for "chronos" is "chrome") Of course you can ssh anywhere you like - a browser and ssh takes care of just about everything I need on a daily basis, so I can definitely see using this on a Netbook. I did have one minor obstacle: my website (one of my primary ssh destinations) is protected by ssh keys. That's simple to solve: I just scp'd my .ssh directory from my real computer and then did "ssh -i .ssh/id_dsa.pub ...". That takes care of that. You may have also read that Chrome OS has root as readonly. That's true. However, nothing stops you from doing "mount -o remount,rw /". After that, you can hack away all you want and nothing will be lost when you reboot. I did have some issues in the Terminal - repeating keys, odd characters showing up, lockups... expected in something so early. So - the race is on. Apple is expected to put out its tablet PC next year and next year is Google's projected date for Chrome OS. There are even rumors that Microsoft will enter the fray with its own free OS (bet on them screwing it up if they do!). Who will win? I'd guess almost certainly not Microsoft. They just can't help themselves: they will always pee in the beer before serving it. Their security track record hasn't been polished up by Vista or Win 7 either and they NEED the money from OS sales. Google gets money from advertising, gmail and other sources, Apple gets it from hardware - Microsoft makes its dough from selling software. Already more and more companies are switching to Open Office and this sort of appliance will just hasten that - I don't see that Microsoft can afford to give away an operating system. Though Microsoft is hoping to steal search from Google with Bing. Their latest move on that front is to make a deal with Rupert Murdoch where they pay him to allow Bing to index his vast news empire while locking Google out. They think this will freeze out Google, but it will not, for numerous reasons - one of the more obvious being that Google will have indexed someone blogging about the news they read at a Murdoch site within minutes while Microsoft is likely not to even know about the post for half an hour or more - Bing just doesn't have the horsepower and may never have it. If Google gets out in front of Apple, Apple's salvation could be apps. If their Tablet runs iPhone apps, I don't think Google can easily compete - Google plainly doesn't have the in-house talent for slick apps and they haven't yet developed any real relationship with developers. Of course the corrolary is that Apple iPhone developers are somewhat unhappy and rebellious, so that does leave an opening - but Apple's strong control is what keeps the user experience stable, so letting developers run free is not necessarily without peril. One thing for sure: the second decade of this century is going to be interesting! See also Fear and Loathing of Chrome OS? If you do not have a Wave id yet, I still have invites left! He mistakenly thinks Chrome is no threat to Microsoft. Anything but Microsoft, right? So, people are going to pay almost the same amount of money for a machine that does significantly less and relies on the cloud? (Rasoning that XP adds roughly $15 to the price of a netbook; I can't imagine Win7 Starter being much more considering the Starter -> Home Premium upgrade pack costs around $70 retail.) This is just like current Desktop Linux: it won't go anywhere as long as switching is less than a lateral move. I'll be talking more about this in a future post, but no, it's not "anything but Microsoft". For people like Dell, $15 per unit is a big deal. Also, many of these netbook machines will be given away to get wireless subscriptions and so on - again, $15 is a big deal. But there are even more reasons why this is bad news for Microsoft. I'll explore those in that later post.